A right to information (RTI) application has revealed that the Gujarat government has acquired and handed over a whopping 81.95 crore square metres of land to top industrial houses, most of it dirt cheap, over the last one decade. It also revealed that the price at which the land -- which belonged to farmers, or was common village gochal land meant for cattle -- varied between a mere Re 1 to Rs 900, depending on the area, but in every case much less than the prevailing market rate. Calculated in hectares (ha), the total area handed over to industrial houses comes to 81,934 hectares (ha), all of which was given away to the tycoons either as outright sale or as lease. Of this, a whopping 28,502 ha belongs to the Dholera Special Investment Region (SIR) in Ahmedabad district alone. This includes the land of 22 villages, coming under the Narmada command area. The entire area has now been decommanded, and here no farmer will be allowed to carry out any agricultural activity. Information obtained through RTI, running into 50 pages, also revealed that on March 18, 2011, the state government passed a resolution which said that the entire area should be treated as having been "de-commanded", in the expectation that industries would heavily invest in Dholera SIR. The rate at which the area was handed over to the industrialists was a mere Rs 20 per square metre. "The farmers of the entire area have been turned into landless", a Gujarat Parivartan Party (GPP) release, based on its RTI application, said. Quite in line with the Dholera area, in Kutch district, land was handed over the industrial houses at an even cheaper rate, the RTI details revealed. 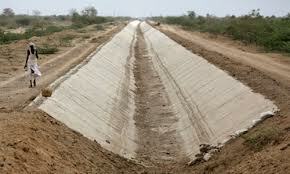 In Mundra taluka, the Adani group was handed over land for anywhere between Rs 2 and Rs 25 per square metre. The area handed over the to the Adani Group was 4.32 crore square metres, which included common grazing village land for the cattle. Significantly, the current jantri -- which is the government assessment of the market value of land -- for the area is a huge Rs 2,500 to Rs 7,500 per square metre. Significantly, the jantri rate is always considerably less than the prevailing market rate, a certain percentage of which is fixed to be charged as stamp duty payable on each land transaction. Further, the RTI application revealed that in Vadodara district's Savli taluka, on a 23 km stretch starting at the Manjusar Gujarat Industrial Development Corporation (GIDC) estate and ending at the Halol GIDC estate, a new SIR is taking shape, endangering the farmers to become landless. "In all 12 SIRs are proposed in Gujarat. If this happens, farmers of as many as 700 villages will become completely landless", the GPP claimed on the basis of the information it has received through the RTI application. All this, the GPP alleged, handing over land dirt cheap has cost state coffers richer by Rs 30,000 crore. adding, this has happened when the Supreme Court has given "clear-cut directions" that without gram panchayat nod no land be transferred to any industrialists. In fact, after 2011, following the apex court directions, the Government of India wrote to the chief secretaries of each state that gram sabha clearance is a prerequisite for any land transfer to purposes other than agriculture. "Despite this, the apex court directions are not being implemented."